while the centrifugal forces are such as the following. Scottish nationalists want independence from Britain. (Scotland receives subsidies from London.) Unlike the Irish, the Scots have little to complain of at the hands of the English, at least in the past two centuries. The Scots were among the greatest advocates and beneficiaries of the British Empire; and far from being an anti-imperialist movement, Scots nationalism is a consequence of the decline and fall of empire rather than a rejection of British imperialism. Catalan nationalists want independence from Madrid. Catalonia is more prosperous than the rest of Spain, and its taxes subsidise other parts of the country. Catalans felt oppressed by the Franco regime. 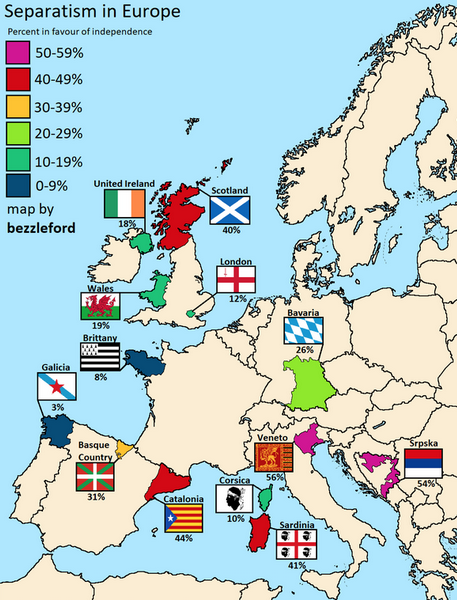 Basque nationalists want independence from Spain. A northern Italian movement wants to disembarrass that prosperous part of the country of its perpetually impoverished south, which it must subsidise. Many Bavarians want independence from Germany. Dalrymple points to factors in the rise of separatist movements. People dislike their near-neighbours more than they dislike distant ones. Since hatred is by far the strongest political emotion, it is not surprising that people in search of an identity find it in distinguishing themselves, usually with dislike, from their nearest neighbours. There is the search for identity in modern conditions, in which even in supposedly small countries, large cities make anonymity the normal daily experience of the majority. In such conditions nationalism, like tattooing and piercing, becomes a shortcut to personal identity. Why are the separatist movements strongly pro-EU? (This appears strange in so far as the EU would destroy or replace national sovereignty.) Why are nationalist centrifugalists so eager to form an alliance with EU centripetalists, who wish to efface the very thing the nationalists claim to be seeking? Dalrymple examines three hypotheses. The nationalists might not be aware of the contradiction. Few of us are logical calculating machines who work out the full implications of our beliefs, let alone always act in our own best interests. Out of the frying-pan into the fire: nationalist dislike of immediate neighbours may loom so large that it overcomes thought. Leaders of the nationalist parties or separatist groups want there to be more places at the top table—vacancies that they would then fill. They might even rise to the dizzying heights of the former prime minister of Luxembourg, who has long bestridden the world, or Europe at any rate, like a colossus. This he could never have done without the existence of the EU. In other words, personal ambition and the megalomania of petty potentates. What should be the attitude of leaders of the EU towards the potential fracturing of the EU member states as they are at present constituted? Dalrymple explains. In the short term, EU leaders have to pretend to support the current arrangements, because for the moment power is concentrated in the hands of the leaders of those member states. If the power in Madrid or London begins, however, to seep away, the path to a Europe not of the nations but of ‘the regions’ is cleared.